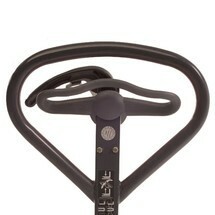 Instead of £820.00. You save £41.00 due to the online discount . The low-noise Jungheinrich AM 22 hand pallet truck is extremely quiet, thus allowing you to use it for transport and deliveries in quiet zones. It offers capacity for loads weighing up to 2,200 kg, which are transported in virtual silence thanks to low-noise wheels and noise-absorbent mats. The low-noise Jungheinrich AM 22 hand pallet truck with 2,200 kg capacity was developed in order to minimise the noise produced when transporting loads. 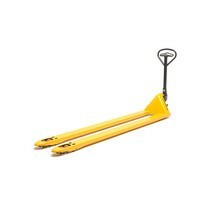 This makes the pallet truck ideal for deliveries in the early morning or in low-noise areas. 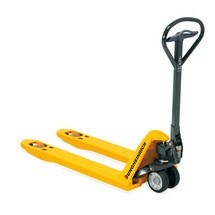 The pallet truck can also be used in salesrooms with direct customer contact. 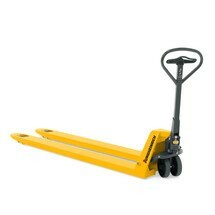 Thanks to the short headlength, the hand pallet truck remains highly manoeuvrable in even the tightest of spaces. It can be operated from any position via the ergonomic, user-friendly control element, while minimum effort is required thanks to the optimised pump hydraulics, which make light work of heavy loads. 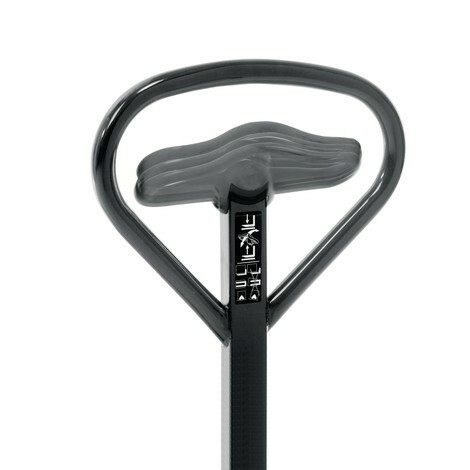 The hand pallet truck features special noise damping for use in low-noise areas. This is achieved by means of special roller bearings, smooth-running steering castors with bushings and solid rubber tyres, tandem fork rollers made from polyurethane and special noise-absorbent mats. Depending on the floor surface, this special equipment allows you to reduce noise production by up to 50% when compared to the standard version. The Jungheinrich pallet truck also impresses with its robust, powder-coated steel construction, chromated wheel bushings and welded tiller mounting offering proven brand quality. 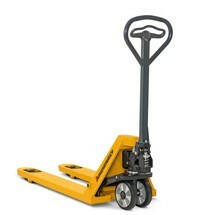 The low-noise Jungheinrich AM 22 hand pallet truck with 2,200 kg capacity is available with different fork lengths. When you want to keep noise to a minimum, you can count on the low-noise Jungheinrich AM 22 hand pallet truck with 2,200 kg capacity. Order it from our shop today.